Baba Yaga had been rescued from the clutches of her son Rasputin, but the Queen of Witches remains trapped inside a magical matryoshka doll. Delving into hidden chambers deep within the Dancing Hut, the heroes must open the nesting dolls imprisoning Baba Yaga, but they must also contend with the hut's most dedicated guardians including the former queens of Irrisen. When the time comes to finally face Queen Elvanna inside the Dancing Hut's innermost sanctum, will the heroes defeat her and free Baba Yaga, or plunge Golarion into a new ice age? 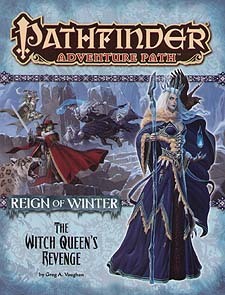 This volume of Pathfinder Adventure path concludes the Reign of Winter Adventure Path and includes. "The Witch Queen's Revenge," a Pathfinder RPG adventure for 15th-level characters, by Greg A. Vaughan. An escape from Whitethrone in the Pathfinder's Journal, by Kevin Andrew Murphy.